It was my friend Danielle's birthday, and since I am a big preggo, our usual celebration at the pub was not really looking that appetizing to me, so we had her and her boyfriend over for dinner. I made Thai chicken satay with peanut sauce and an Asian Noodle Salad. It was yummy. But it was nothing compared to the cupcakes; at least in my opinion! I thought about picking some up from the local bakery that makes to-die-for cupcakes, but then I knew that I would just end up picking up 2 dozen and eating one of them all by myself. And also spending like $50. So I decided I would attempt to make some instead and try to compete. Cream butter, sugar and eggs together until fluffy. Add vanilla and the contents of the scraped vanilla bean. Mix into the batter. Combine the dry ingredients in a bowl. Add 1/2 of the dry ingredients to the batter, mixing until just combined. Add the milk. Once incorporated, add the remaining dry ingredients and stir until combined. 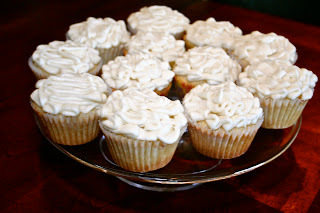 Pour into cupcake tins. Bake for 20-25 minutes. Let cool before frosting. In a bowl, beat cream cheese with butter until light and fluffy. Beat in milk, vanilla and coconut extract. Reduce speed and beat in icing sugar, 1 cup at a time until fluffy. I usually add a bit more milk until I get it to the right consistency. 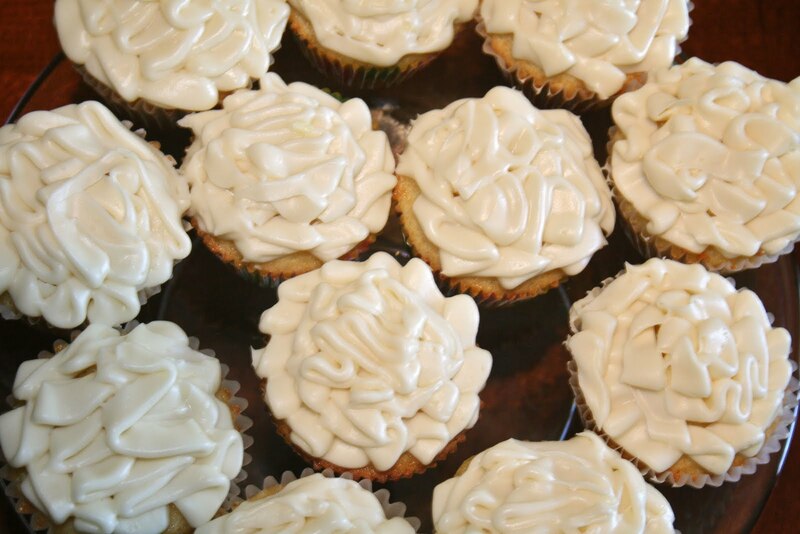 Try not to eat all the icing before you get all the cupcakes iced. It's hard, I know. your piping looks cute i think!